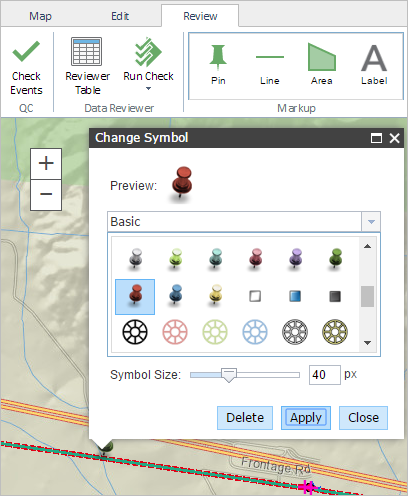 You can add shapes or labels to your map to remind you where changes in characteristics occur or edits need to be made. 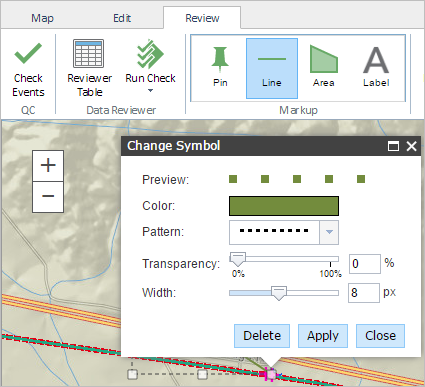 The markup tools allow you to add points, lines, polygons, and labels to a map during a single browser session. Use the following steps to add a point using the markup tools. In the Markup group, click the Pin button. Click the map where you want to place a point. 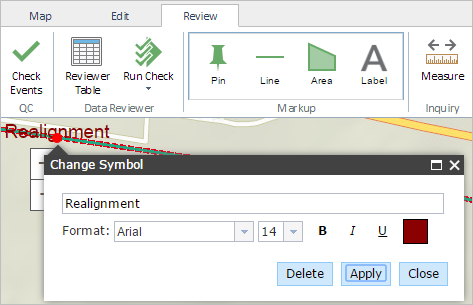 To change the type of symbol, click the drop-down arrow to select the symbol category and select the symbol. Click Apply to apply any changes made. You can edit the point by clicking it on the map. Use the following steps to add a line using the markup tools. In the Markup group, click the Line button. Click the map where you want to begin drawing the line and double-click to finish drawing the line. To change the color of the line, click the color box and select a different color for the line. You can edit the line by clicking it on the map. Use the following steps to add a polygon using the markup tools. In the Markup group, click the Area button. Click the map where you want to begin drawing the polygon and double-click to finish drawing the polygon. 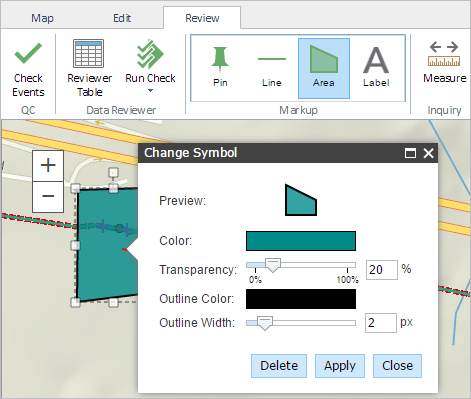 To change the color of the area, click the color box and select a different color for the area. You can edit the polygon by clicking it on the map. Use the following steps to add a label using the markup tools. In the Markup group, click the Label button. Click the map where you want to place a label. To change the text of the label, type the text into the text box. You can edit the label by clicking it on the map.